The Highland Council has completed more than �5 million worth of repairs since the severe widespread flooding of 26 October last year, which affected communities on the east of the Highlands ~ from Dingwall to Thurso. Teams within Transport Environmental and Community Services responded speedily and effectively to the emergency on the day, helping protect properties from flooding and closing roads which were affected by floodwaters, landslides, damaged bridges and culverts and from the numerous trees blown down in subsequent gales. In the aftermath of the exceptional event, came the clean up of the road network and detailed assessments of the damage caused. Much of the work involved general repairs to the road network. However, there were a number of locations where significant levels of damage occurred, which required detailed and complex design solutions. Contractors were employed to complete major works, which included the replacement of Quebec Bridge, near Tain; the repair of a number of major landslides including the road to Mitchell Hill Cemetery, Dingwall, the A 862 at Ardullie; the B 9176 at Dalneich Bridge and Aultnamain; the Corkscrew Road, by Alness; Torboll on the Strathcarnoch Road and the Boggan Burn, Dingwall. A detailed schedule of the works totalling �6.3 million was submitted to the Scottish Government earlier this year and a �4 million grant was confirmed earlier this year with the hope that more will be forthcoming. Councillor John Laing, Chairman of the Transport Environmental and Community Services, paid tribute to the staff, who have been nominated for Team of the Year in the Council's Annual Quality Awards, which recognises achievement and encourages improvement in performance. He said: "The team deserve the highest praise for their response to the emergency; for carrying out the subsequent clean up; assessing the level of damage; consulting with the public; issuing emergency contracts and providing information to secure additional funding from the Scottish Executive. The Scottish Government has been most sympathetic to our plight and it is hoped that the major flood prevention schemes will also attract support from the Scottish Government in the form of grant assistance." The Council is also making progress on promoting three flood prevention schemes in Inverness and one in Lochaber. These plans for River Ness, Dell Burn and Millburn (all Inverness) and River Lochy and Caol (near Fort William) will shortly be published and open for objection for a period of 90 days. The estimated cost of the schemes is �14.5 million. 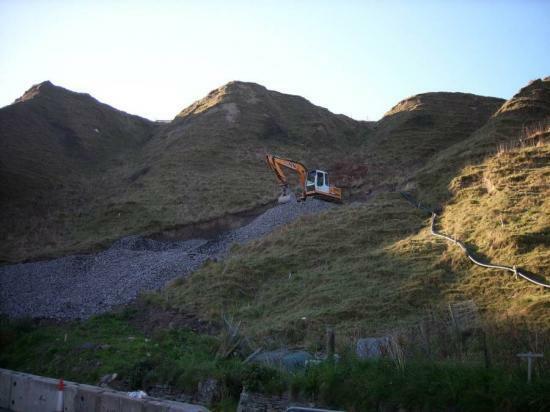 Works ongoing at Scrabster Braes following a major collapse resulting from the storms in October 2006.